Use this Lesser Utilized Stat to Find Cheap Power in Fantasy Baseball! Welcome to a new series here on Fantrax! I am still thinking of a creative name, but basically these articles will drop twice a week and allow you to get inside my statistical mind. I will be covering trends, regression candidates, players to buy/sell and really anything else I find interesting from the baseball season! In this inaugural edition, we’re going to on the hunt for cheap power in your upcoming drafts. Fantasy Baseball is an amazing game because there are so many different strategies you can use to build a team. But even more so, there are so many different stats available that you can prepare for your strategy in many different ways. A stat I like that I often don’t see written about is Brls/PA%. The first reason I don’t think it gets a ton of coverage is because it is a relatively new stat, introduced within the last couple of years. Another reason is, it may not be the easiest to understand. First, let me break down the stat, before telling you the players that stood out in that category. The regular season is almost upon us! Don’t worry, there’s still time to add that “one more league!” Leagues are still forming at Fantrax.com, so head on over and jump in one today. 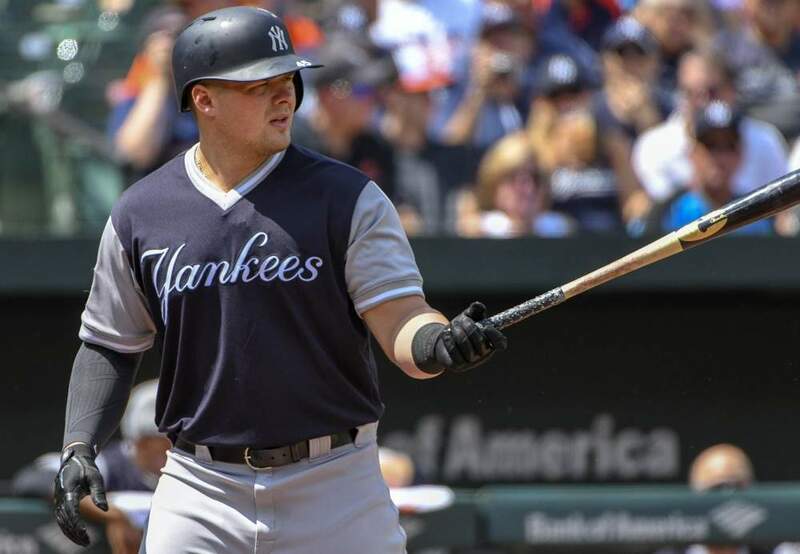 Luke Voit is going off the board as the 13th first baseman with the 179th pick overall, according to Fantrax ADP. While he has been climbing, there is certainly a lot to like here. First off, Voit led all hitters (min. 50 batted ball events) with 12.4 Brls/PA%. That is ahead of the likes of Joey Gallo, J.D. Martinez, Khris Davis and all the best power hitters in the game. The big bopper slugged 15 homers in just 161 plate appearances with the Yankees last year. He also paired a 47.0 percent hard hit rate with a 37.0 percent flyball rate, showing that the Brls are to be trusted. In a Roto league I would take him over Miguel Cabrera and Carlos Santana, both of whom have higher ADPs. Tyler O’Neill is the 78th outfielder off the board with the 310th pick, according to ADP. Yet, you should be looking to take a flier on the young masher and stash him. O’Neill had a 12.0 Brls/PA% in 2018, trailing only Voit for the league lead. He paired that with a 45.3 percent hard-hit rate and 48.0 percent fly ball rate, which should have you long ball lovers salivating at the mouth. He has shown off that massive power this spring, but he does need to cut down on the strikeouts. In a small sample size last season he had a 40.1 percent strikeout rate and just a 4.9 percent walk rate. That makes him a fade in points leagues, but in Roto he truly has the capability of hitting 30-plus homers if the playing time is there. I am a believer that talent wins out so I do expect him to steal a job at some point this season. Shohei Ohtani came to the U.S. with the reputation that he was a great pitcher, who also likes to dabble as a hitter. Ok, maybe that is an exaggeration, but I don’t think there was anyone who expected him to hit as well as he did last season, especially after his awful spring training. However, Ohtani had the eighth highest Brls/PA% among hitters with at least 50 batted ball events. That ranks higher than Max Muncy, Nelson Cruz, Giancarlo Stanton, and Aaron Judge. In fact, this is one of my favorite stats. Ohtani had a higher Brls/PA% than MLB hitters had while facing him who only managed 2.8 Brls/PA%. In fact, as a pitcher his rate is better than Walker Buehler, Jameson Taillon, Zack Wheeler, and Gerrit Cole. While he will not pitch this season, he will hit and is expected to return to the Angels lineup in early-May. He has an ADP of 137.3, which is honestly higher than I expected, but my guess is dynasty leagues are the ones pulling him up the board. If you can get him later than that and stash him I think he can pay dividends even as a batter only this season. Randal Grichuk is going to hit 40 homers one year and no one is going to be surprised. He possesses so much power but has yet to put it all together on the field. In 2018 Grichuk had the ninth highest Brls/PA% at 9.5 percent. That was actually down from his 10.0 percent mark in 2017, which ranked sixth that season. So not only has he finished inside the Top 10 in consecutive seasons, but he has a 38.9 percent hard-hit rate and a 44 percent fly ball rate. Add in the fact that he has an everyday job in right field and is projected to hit fifth for the Blue Jays, in a park that was rated the fifth best for HRs for right-handed batters, according to Baseball Prospectus. Going as the 60th outfielder off the board at pick 252.59 overall, he is a cheap source of power, with the upside to vastly out-deliver that pick. Max Muncy has been a target of mine all draft season. I get that there are some concerns with him, but I tend to think the good outweighs the bad. First, he had the 11th highest Brls/PA% at 9.4 percent. He also had a 47.4 percent hard-hit rate and a 44.9 percent flyball rate, making him a part of the 40/40 club. Lastly, he had a walk rate of 16.4 percent good for a .391 OBP. Many people question if he can duplicate last season. If he was able to keep that pace up, he would be a first-round pick. But, I expect him to have more than 481 plate appearances, as he can play all over the diamond and his bat is too good to sit. I think the extra at-bats will help him reach the numbers he had in 2018. Additionally, he can hold his own against lefties (had a .361 OBP and .275 ISO against them) plus while the strikeout rate did increase in the second half, he still posted a .300 ISO and .366 OBP. Those often cited reasons to be worried about Muncy simply do not bother me as much as others. I have been targeting him in points and OBP leagues and recommend you do the same as well. Make sure to follow me on Twitter, @MichaelFFlorio! Michael Florio is the winner of the 2018 FSWA Baseball Article of the Year and was a finalist for the 2017 Fantasy Football Writer of the Year. He has hosted video/radio shows, written for a number of print and web publications including the AP, NY Daily News and much more! Fantrax was one of the fastest growing fantasy sites of 2018 and we’re not slowing down any time soon! With multi-team trades, designated commissioner/league managers, and drag/drop easy click methods, Fantrax is sure to excite the serious fantasy sports fan – sign up now for a free year at Fantrax.com.